1. The Organic Pharmacy Carrot Butter Cleanser - The name alone made me want to try this cleanser. Carrot Butter - hello! Get on my face. The oilier and thicker a cleanser is, the more I want to try it. This is incredibly rich, buttery and oily and feels wonderful on the skin. It did a stellar job at removing makeup, though it has quite a steep price tag so I tend to save it for my second cleansing step so I can really allow the natural ingredients like rosemary, carrot, shea butter and chamomile to get directly onto my skin. It works great for my oily skin, though the richness of the formula would make it ideal for someone with dry skin as well. I apply it with dry hands to a dry face and massage it in for 30-60 seconds. If my skin is feeling irritated or dry, I can leave it on for a few minutes as an extra treatment. Typically though, I massage it in and then use a damp cloth to remove it. It does emulsify into a gentle milk, but I have found that I definitely need a cloth to help remove all residue. Just using water is not enough to fully dissolve the cleanser, but I enjoy the added step of using a wash cloth to give a slight exfoliation. Afterwards my skin is left smooth, hydrated and incredibly calm. A perfect addition to a winter skincare routine. 2. 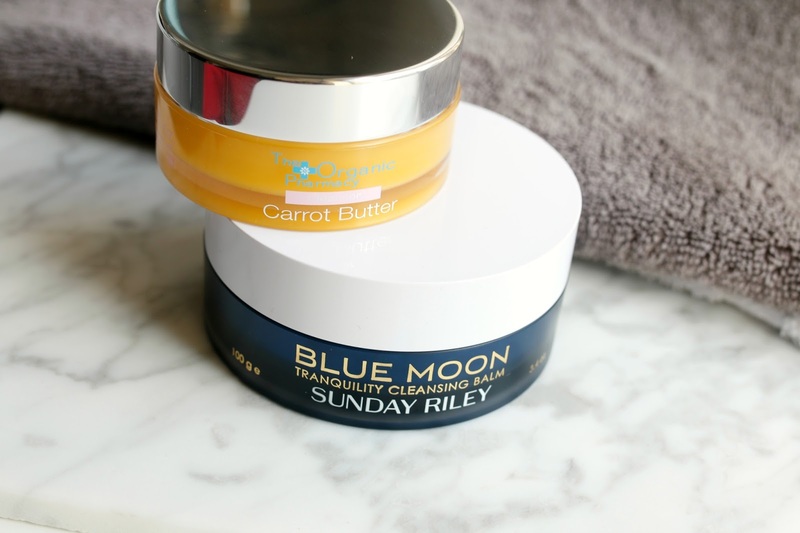 Sunday Riley Blue Moon Tranquility Cleansing Balm - Another hit from Sunday Riley (though honestly, I feel she can do no wrong with her skincare)! Though the usage does specify that it can be used to remove makeup, I preferred to use it as a second cleanse. It did get off most of my foundation, but with certain really stubborn eye makeup, I did have to break out a stronger cleansing oil. The texture is a bit more gritty (not like a scrub, but not as buttery as a typical balm), so it felt a bit more exfoliating to me which I loved! The instructions also advise using it as a treatment mask. I leave it on the skin for 15-20 minutes and found that it really gave my skin a nice added boost of hydration. As with most of my cleansing balms, I applied this with dry hands to a dry face and massage in for 30-60 seconds. It does emulsify to a milk, but as with The Organic Pharmacy Carrot Butter Cleanser, I needed a cloth to remove it. 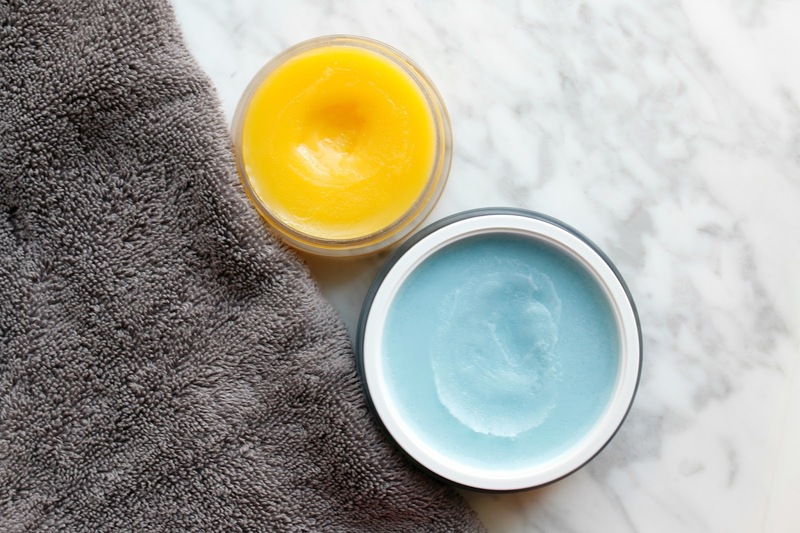 My skin definitely felt smooth, plump and hydrated after, but it seems to have more exfoliating properties to it which made my skin more glowy and radiant than other cleansing balms. I like to use it 3-4/x since it delivers such strong results for me, and my skin has seemed much less oily when using it regularly. I do think it would be great for all skin types, even sensitive because of its soothing essential oils and chamomile. 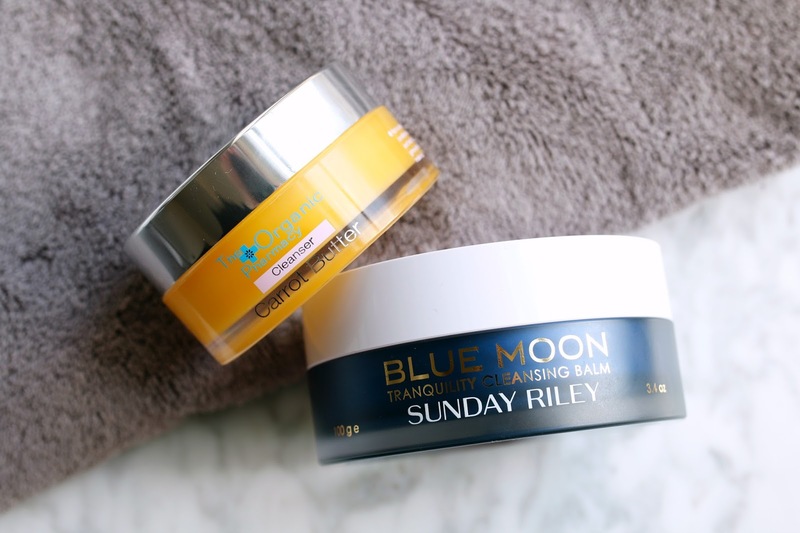 Sunday Riley continues her skincare winning streak in my eyes with this new launch. I cannot wait to see what she comes up with for 2016! Yeah! I've been waiting for your review on the Carrot Butter Balm. With my dry, mature skin it sounds perfect. It's now on my shopping list. Thank you and Happy New Year! I love Blue Moon and like you, I like all I have tried from the Sunday Riley line. I've heard about the Carrot butter and it's definitely tempting!